This naturally fermented, effervescent drink originated in China 2000 years ago. High in antioxidants, it is a natural probiotic, which makes kombucha tasty AND good for you. You might have tried kombucha at your local cafe or supermarket – it is also simple to brew yourself. All you need is a healthy scoby, ordinary tea, and sugar. Scoby (Symbiotic Culture of Bacterial Yeast) is the kombucha equivalent of a ginger beer bug. It contains good microbes to turn sweet tea into kombucha as well as enhancing gut health. Find one on the internet, or ask a kombucha-brewing friend to share some of theirs. Brew in a big glass jar. A large pickle jar or cookie jar is perfect, just make sure the opening at the top is large enough for your hand. Glass is best because kombucha’s acidity can corrode a metal container and could leach heavy metals out of ceramic surfaces. Jazz up your kombucha by adding fresh fruit or berries from your garden when you bottle it. Leave your bottles of fruity kombucha on the bench for a day or two for extra fizz and flavour. Kombucha can become explosive, so make sure you check regularly for gas build-up. Kombucha makes a refreshing base for summer punch, just replace the cold tea or ginger beer component with kombucha. You can even use kombucha as a sourdough starter. Just add flour! Use the pizza base recipe opposite for the best artisan pizza you’ve ever made. This easy recipe will have you sipping your own homemade fizzy probiotic drink within a week. Brew the tea in about four cups of just-boiled water. Steep for about 10 minutes then remove tea bags, add sugar and stir to dissolve. 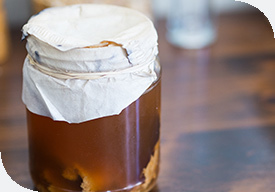 Tip the mixture into a large wide-necked jar, add remaining cold water then add the kombucha liquid and scoby. Cover the jar with a finely woven cloth and let it sit at room temperature for about a week, until it reaches the desired taste. Scoop out the scoby, place it in a small bowl with some of your fresh kombucha and pour the rest of the liquid into bottles. Your kombucha is ready to drink! You can use the scoby and reserved kombucha to make a fresh batch, or pop it in the fridge in a glass jar to keep until next time. It will keep for months. Kombucha’s naturally occurring yeast lends itself to making delicious sourdough bread, perfect for artisan pizza. Mix flour and kombucha together and leave to rise in a warm place for between2 and 4 days, kneading morning and evening. About 6 to 12 hours before you want pizza, divide the dough into two balls and leave to rise separately. Liberally dust a baking sheet with flour then roll out the dough and spread with your choice of toppings. Bake in a very hot oven, 250°C, for 8 to 10 minutes.